Of all of the auctioneers I’ve seen and heard, Sherry Truhlar is in a class by herself. Sherry makes an audience come alive with enthusiasm, laughs, excitement and, most importantly, money and more money. Sherry is a dynamo dedicated to dealing with the details. Our guests adore her and ask us each year to bring her back. It is a total pleasure to work with this talented professional, who knows her business and all aspects of charity auctions and events. On stage she sparkles and commands her audience using her entertaining auctioneer skills but always with appropriate repartee. Our fundraising committee wanted to introduce a live auction to our annual fundraiser but didn’t know how to get started or what to expect. 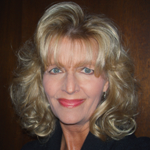 A couple of us had taken Sherry’s procurement telecourse, and others had used her registration and checkout DVD to streamline that process last year, so we decided to hire her to guide us through our event planning process and to be our auctioneer. What a difference she made! In addition to holding our hands every step of the way, she had fresh ideas, spot-on advice and a clear sense of what would work best for our crowd. The end result was a fundraiser that successful beyond our wildest dreams. Gross proceeds were up nearly 75% over last year—almost $73,000–and our net totaled over $62,000 (vs. $40,000 the previous year). Plus, everyone really enjoyed the live auction—she was hugely entertaining as she drove up the bids to benefit our cause. We couldn’t be happier! 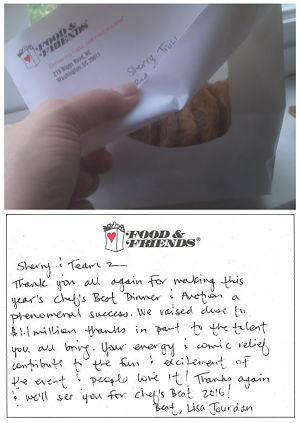 Cookies and a thank you note. Sweet! Thank you all again for making this year’s Chef’s Best Dinner & Auction a phenomenal success. We raised close to $1.1 million thanks in part to the talent you all bring. Your energy and comic relief contribute to the fun & excitement of the event, and people love it! Thanks again and we’ll see you for Chef’s Best 2016! This is a voicemail I received from Karen Bontrager, a volunteer for a gala in Virginia. She found my site while searching for information on benefit auctions. Intrigued by the information she found here, and called me up to let me know how much the training was helping her. Getting feedback like this absolutely makes my day! On behalf of the many men, women and children who are homeless in our community, we want to thank you and your team for helping to make the 9th Annual Hope for All Ball, “Guayaberas & Good Times,” on Saturday, December 6, 2008 such a success. We were able to raise over $1.2 million dollars to support our mission. Although we’ve always had a very personable auctioneer who volunteered to conduct the live auction in the past, I wanted to take the gala in a different direction. I decided to try a professional, so we hired Red Apple Auctions, incorporated some of your ideas, and ended up surpassing our auction revenue from 2006 by a wide margin. No one, especially me, expected a record-breaking year when economic news was so dismal! But beyond hitting a new record, what stunned me the most during the live auction were the new bidders. Guests who had never bid in any prior event were some of my winning bidders. To me, this indicated that maybe the advantage of using a professional auctioneer who isn’t “known” to my audience ensured our guests felt more comfortable bidding because you engaged everyone in the ballroom with your dynamic personality and they were all treated equally. Your team did such a great job of taking care of everyone on the floor with high energy and fun. You and your team were also very visible and active during the. Silent auction, which helped us exceed our goal for that segment. As an event planner, I want each guest to feel special and they did. I believe this is why there was a different energy in the room because each person was a unique entity coming together from the common mission of supporting Camillus House. I was pleasantly surprised with my post-event report from Red Apple Auctions. It was thorough and very detailed with great photos and information. Your consultations prior to the event were most helpful. 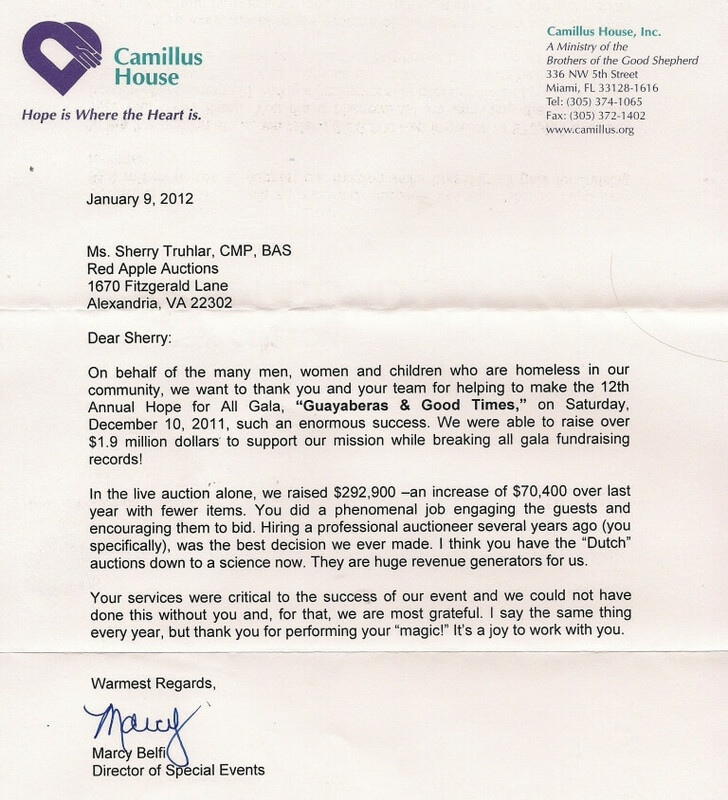 Camillus House does not want to hold another auction without you. Your services are critical to the success of our event and we hope to raise even more money and surpass our previous goal this December. Once again, thank you for performing your “magic” and helping us to end chronic homelessness and create a better future for all who are served by Camillus House. On behalf of the many men, women and children who are homeless in our community, we want to thank you and your team for helping to make the 10th Annual Hope for Ail Ball, “Guayaberas & Good Times,” such an enormous success. We were able to raise over $1.4 million dollars to support our mission. This is the most we have ever raised in the annual fundraiser –$337,715 in the live and silent. We thought we had a record-breaking year in 2009, but this surpasses “everyone’s expectations. The advantages of using a professional auctioneer cannot be measured. You know our audience now and your dynamic personality was evident throughout the evening. Even with some last minute “add-ons,” you kept everything running so smoothly. You and your team did an outstanding job! You made my job easy. Your services were critical to the success of our event and we could not have done this without you and, for that, we are most grateful. Thank you for performing your “magic” again to help us end chronic homelessness in Miami Dade County and create a better future for all who are served by Camillus House.